Our company offers a dust-free cleaning system to remove dangerous creosote. We offer a complete inspection of chimney and give written evaluation reports. We offer repairs to the interior and exterior of chimneys such as: crown repair on chimney top, tuck pointing on missing or loose mortar joints, brick repair or replacement, refractory repairs and firebox repairs. We offer U.L. listed stainless steel liners for chimneys that have damaged liners. Our caps are also made of stainless steel, which will last a lifetime. 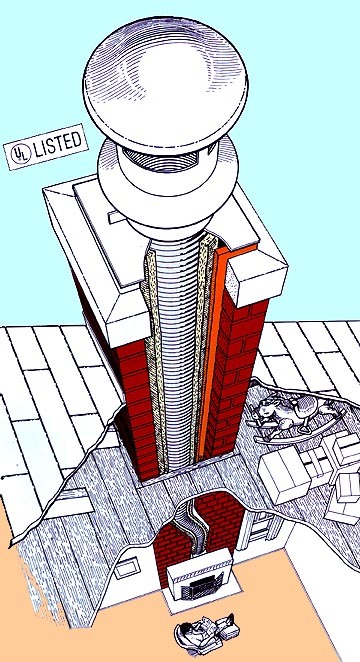 Protect masonry chimneys from water damage. Cleaners, deodorizers, carbon monoxide detectors, creosote prevention chemicals, etc. Special dampers that save in preventingheat loss. Evaluations and remedies for complex smoke problems. Animal and bird removal.